REBIRTH is a 4K timelapse film that I released during the summer of 2018. This blog series highlights a few behind-the-scenes details about locations and the process of making the film. Read this one or skip ahead to parts 2, 3 or 4! Put simply, events that would take several minutes or hours can be squeezed into much shorter sequence. So, for example, the blooming of a flower can elapse over several days. However, it can be shown in a timelapse sequence that lasts for only a few minutes. I came across this technique in 2017 and I’ve been honing my skills ever since. I had started gathering footage for the first film several weeks before Hurricane Maria was a even blip on meteorologists’ radar. It was not my intention to create a before and after video. However, I could not – in good faith – release a video depicting Dominica in all her natural glory, knowing full well that life had changed drastically for so many of us. The second short film contained only post-Maria images, and focused on the drastic change to the island’s landscape. I really wanted to show the contrast between the before and after effects of the storm. But I could not conceptualize a creative and efficient way to do this. In the end I decided against comparing. What was left is a new Dominica. A documentary showing leafless trees and brown mountainsides, across the once lush Nature Island of the Caribbean. Months passed before I did any serious shooting after the second release. I have no real reason for this, except to say that I had convinced myself that I needed two essential pieces of gear to significantly improve my timelapse game. The gear could certainly help. But not having it should not have kept me back. To put it plainly – I was suffering from a bout of laziness! If you’ve ever seen a professionally produced timelapse video, you may have noticed some subtle movements during the various clips throughout the video. These are often slow movements from left to right, back to front, top to bottom or vice versa. It’s possible to achieve a similar effect during post production, but you’re very limited in scope and it’s just not as efficient. I had vowed to get this system before doing a third timelapse video, but alas, this did not happen. Maybe I’ll get it for the next one? By the time I made up my mind to do a third timelapse film in April 2018, I knew what my message had to be. I wanted to show how far Dominica had come since September. My emphasis would be nature and its recovery, rather than people and urban areas. I was inspired by Mother Nature’s comeback. To my mind, the resurgence of so much green was miraculous. 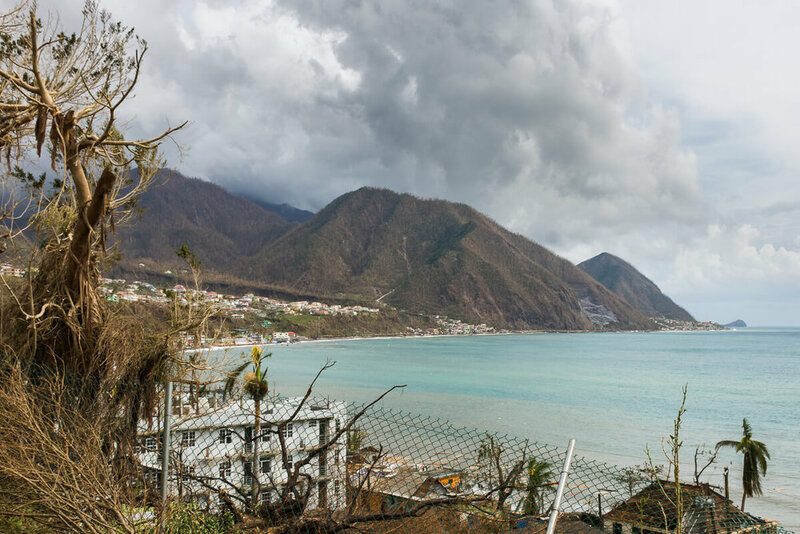 I could vividly remember how unrecognizable Dominica was, just a few days after Hurricane Maria touched ground. This view was representative of most of Dominica’s landscape in the days that immediately followed Hurricane Maria. I took this photo on the morning after. Note the dead mountainsides and the damaged roofs. Now, even though our main forest reserves are still recovering slowly, other parts of the country are nicely covered in a rich coat of green. Over the last few weekends, I visited different areas around the country, capturing footage for the new film. I thought my experience from the previous videos would help fast-track this process, allowing me to dedicate more time for post-production. However I have found that I’m still learning on the go. I had to return to certain locations numerous times, at different times of the day, because I chose a specific look for a particular scene in my mind’s eye. I visited some of these locations more than three times just to get the correct shot. The production process of can be brutal. It is time-intensive – countless hours in the field and even more hours in post-production; Exhausting – getting up early enough to be at certain locations before sunrise… and then being out all day; And relatively expensive – gas isn’t cheap, and several locations will cause more significant wear and tear on my vehicle. That said, I would not trade this experience for anything!